For 2019, all Armada models now feature: Standard Rear Door Alert (RDA), Standard Intelligent Cruise Control (ICC), Standard Automatic Emergency Braking (AEB) and Standard Intelligent Forward Collision Warning (I-FCW). 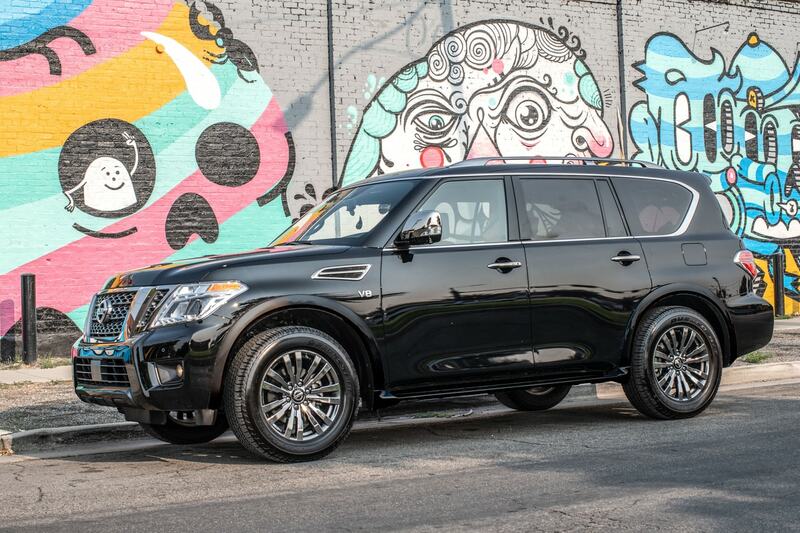 Regular readers will remember an experience we had in a Nissan Armada last year. An over-achieving 18-wheeler clipped us twice, once in the rear and once toward the front as it was passing us. We will forever sing its praises in that we were completely unhurt, although we can’t say as much for the exterior of the Armada. Let me be clear – the five star side crash ratings given by the government are earned. There is a long list of safety features on the Nissan Armada, many of which may have contributed to us walking away from the “bout” with the 18-wheeler without as much as an ache: Anti-lock braking, electronic brake force distribution, intelligent distance control, lane departure warning, blind spot warning and intervention, intelligent backup intervention, and more which are built in, but not as perceptible to the driver. One that is a Nissan-first, and that we are most infatuated with is the intelligent around view monitor. Anyone who has trouble parking or has a “driveway from hell like us” will find this a must have feature. You can see all around your vehicle when engaged – what’s in front of you, what’s behind you and what is on both sides of you. This feature is invaluable. Another factor, which I believe is unique to Nissan, is the rear view camera built in to the rear view mirror. You can see a video of what is behind you supplied by a camera if you don’t like looking at what is portrayed in the mirror. Love the mirror? No problem, you can switch from mirror-view to camera-view anytime you desire and vice-versa. This past week we had another opportunity to spend a few days with the Armada. Thankfully, no 18-wheelers hit us, although I must admit we watched carefully for them and one did “challenge” us as we were entering the freeway on our way to the Texas Motor Speedway for a media event late in the week. The Armada was smooth as silk on the road, both during highway and city driving. It passed the children’s approval when both enthusiastically proclaimed they would be happy as clams if we were to buy one. They loved the rear WVGA color video screens and the wireless headphones that Julian at Prestige had tested for us during their extensive delivery and customer review setup. The way he handles delivery comes closest to actually attending a vehicle launch event of any delivery service we have encountered to date. I loved the power (390 horses) and torque (394 lb.-ft.) of the Armada but admit to being a bit disappointed in the overall 15 miles per gallon that the EPA says we can expect in terms of fuel efficiency. Should fuel prices remain as reasonable as they are currently, that would not be a serious deterrent to ownership, but should they soar back to the $4.00 level, I admit I would not be thrilled. 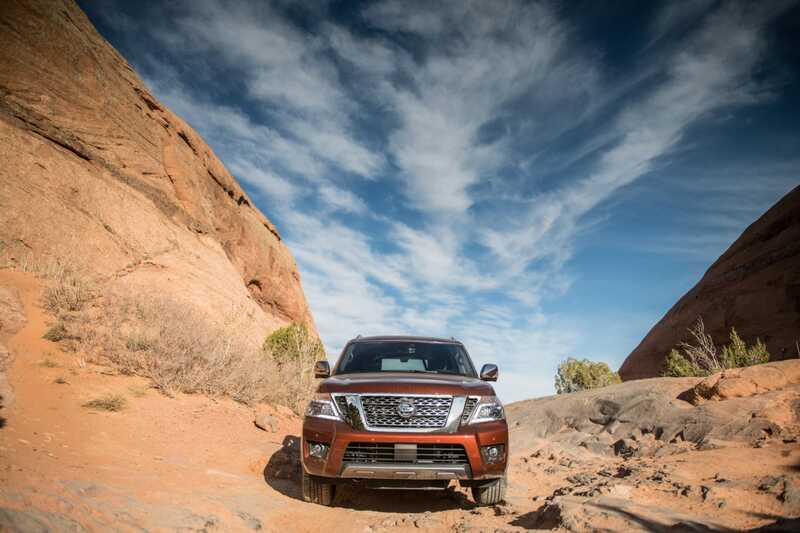 A bright spot concerning this 2019 Platinum four-wheel-drive model of the Armada is the base MSRP. At $62,690, it is at the very low end of what I have been finding in terms of pricing for large sport utility vehicles. Considering our review vehicle Armada is a platinum edition, this becomes even more striking. I have seen base models from some manufacturers coming in at $10-to-$20,000 more than that as a starting price. Trim levels equivalent to that of the Platinum Armada are often in the $90,000 range – far more than I would feel comfortable paying. Even better are the standard features that this third generation Armada has on-board: Standard in this 2019 model year are the Rear Door Alert (RDA) Intelligent Cruise Control Automatic Emergency Braking and Intelligent Forward Collision Warning. Something one might not think about if they don’t have children is the Rear Door Alert system. 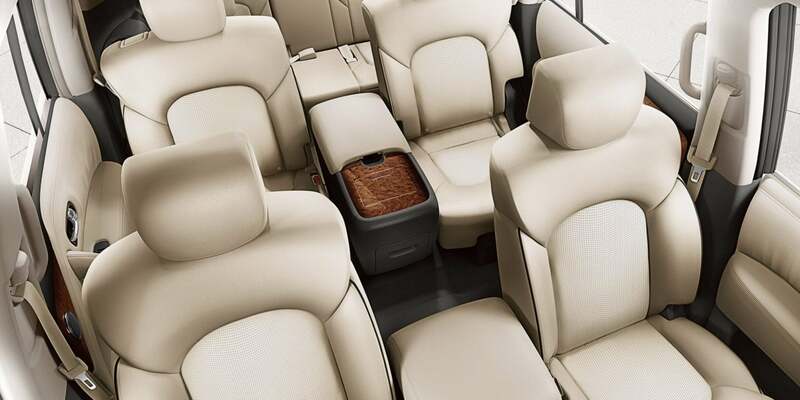 It is designed to help remind drivers of important items that may be forgotten in the rear seat. If the system detects that a rear door is opened prior to driving, as often happens to me when I am about to drive the kids to or from school, I will be “notified” if they have not opened the rear door again at the end of the trip. This is important not just for children, but also if I have put groceries in the back seat and forgotten about them by time I get home due to some distraction (which happens all too often!). RDA is designed to be simple, unobtrusive and can be easily turned on or off (I don’t turn it off!). I guess if I had one recommendation for Nissan on how they could improve the Armada, it would be to equip it with a larger navigation and information screen. Perhaps I have been spoiled by some vehicles with screens the size of a small television set, but I admit to my old eyes enjoying the larger screens. It’s a small desire compared to all the positive aspects of the Armada, but it can’t hurt to note that one item that would cause a complete nirvana!